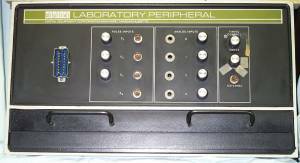 This is a DEC AX08 Laboratory Peripheral manufactured on October 28th 1970, serial number 327. It has the following functions 9 bit multiplexed input analog to digital (A/D) converter with up to 24 input channels, crystal and R/C clocks, up to 3 adjustable Schmitt trigger pulse input, up to 8 digital pulse inputs, and up to 4 digital outputs. It also had a point plot display output. Digital first started selling these units in 1967. The point plot output was used to drive an oscilloscope. Later X/Y deflection monitors like VR14 were used. The display is generated by the processor specifying an 9 bit X and Y location and then requesting that a spot be drawn on the CRT at that location. It then repeates this process to draw the entire display with out of a bunch of dots. On the VR14 link above are pictures and videos of the display from the similar VC8E point plot display for the PDP-8/E. The entire display would need to be redrawn at a 30-60Hz rate to prevent flicker. The successive approximation (more) type of A/D converter uses a digital to analog (D/A) converter as part of its operation. To save cost the same D/A converter is used for the analog to digital converter and the point plot display. The AX08 gives precedence to the A/D conversion so the point plot display can't be refreshed while an A/D conversion was in process. The timing of the AX08 is either controlled by a crystal clock with a period of 100 microseconds or a RC clock with an adjustable period of 20 microseconds to 2 Seconds in 11 ranges. These clocks can be used for software timing and be used as the A/D converter sample clock. The Schmitt trigger digital pulse inputs have an adjustable threshold of -.5 to -2.5 volts and a .7 volt hysteresis. A bit in a register is set when they cross the lower threshold generate an interrupt to the processor if enabled. The 8 "contingency" inputs set bits in the external register when they are at ground. The following picture links below also have descriptions of what is show in the pictures.